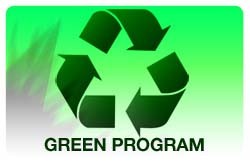 Green Program - Office Innovations Inc.
Our dedication to environmental stewardship is a long standing corporate core value that’s demonstrated in our products and our business activities. For over 20 years, Ricoh has led the office automation industry in creating environmentally friendly products and processes, and in promoting partnerships among government, industry, and environmental groups. We live by a philosophy we call "Our Earth, Our Tomorrow." It’s a statement of the idea that because we all share the planet, we are all obligated to protect and preserve it. We also believe that good corporate citizenship is good business, therefore have successfully achieved ISO 14001 Certification at Ricoh Canada’s corporate, distribution and print facilities.